Please note: If you are having difficulty downloading a report, ensure that your operating system and internet browser are up-to-date. Out of date systems are more likely to encounter issues not outlined in this article. Optionally, customize your report to promote noteworthy content hand selected by you, segment results by subgroups, and show/hide content from your PDF download. Note: If your POPin contains multiple questions, the download function will download all reports. 5. 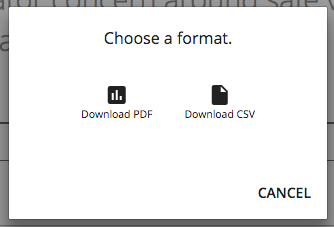 Depending on the option you select, your download will start immediately. Note: Participants in your POPin now have easy access to the report through their "Participate" dashboard. When a user clicks into your POPin, they will have the option to view and download the POPin report through the ellipses icon at the top right-hand corner. Opt to customize your report if you'd like to highlight particular content.